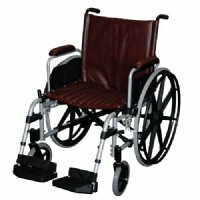 This Non-Ferromagnetic Wheelchair consists of materials such as Brass, Titanium, Aluminum and Plastic. It has been tested and certified by Kopp to pass through their pre-screen and pre-entry door systems. This is the first of its kind to have 24” wheels, which allows the patient to move themselves. Weight capacity is 300 pounds. Storage pocket on rear of chairs has "MR" prominently displayed; reducing the chance it will be confused with a standard magnetic wheelchair or end up in another department.